Nothing makes an RPG more full-featured like one with a crafting feature. 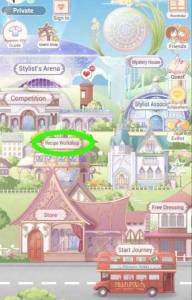 Luckily for love nikki Dress Up Queen fans, its got some crafting feature thrown in the package. Here you'll be able to customize clothes, build something from scratch (Recipe Crafting), Evolve them, or even use Decomposition to your duplicate items to make use of their raw materials to build new clothes. In this part of the recipe workshop, you'll be given the option to change the color of your clothes -- as you have the concluding dyes and fabrics to push through with a customization. Otherwise, you might want to check dyes/fabric in the Store of Starlight (inside Stylist Arena), to obtain necessary crafting items. Take note that even though the process might seem simple enough to follow, the required items to customize do come with a price tag. Additionally, pushing through with customization messes up with the attributes of a particular item - so always take that in consideration. Customization works great if you wish to enter a Competition and make up some specific cloth match a desired outcome (color or pattern-wise). Given that the scoring does not rely on the attributes but the actual appearance, this is where customization works to your advantage. Another option in the Recipe Workshop is Recipe Crafting. This is where you get to craft clothes from scratch -- given that you have the necessary raw materials to actually make the item you need. Apart from this, you also need a blueprint for the item. Blueprints are the ones you randomly earn while you get past some levels in the Campaign (Start Journey). Additionally, they can be purchased in the Store of Starlight (Stylist Arena) if you have enough of the concluding currency earned there. Lastly, it will also set you back some gold coins to push through with crafting (different amounts depending on the item). Some items in the game can be evolve too. Most of which are the ones given as random rewards when you beat the Princess (hard) mode of the Campaign. Evolving items will generally improve the basic item (especially its attributes). Evolution of an item requires different pre-requisites. Nevertheless, you can click on the expand info button ( sign ), to get further instructions where to obtain the required items. Once you have all the items needed, the option to evolve it will be enabled. Take note too that some items can be evolved several times (has evolution stages). Of course, this would mean every concluding stage would require even more pre-requisite items or harder to complete list of raw materials -- not to mention gold. However, evolving items can really be useful as it bumps up the pertaining item's attributes which in return would give a whole lot of score difference in battles. Lastly, there is the option to decompose the duplicate items you have in your inventory. Doing so will rid you of these unnecessary duplicates and make good use of their raw materials to either customize your other clothes or build something from scratch if you have a blue print. Since there would be a lot of surplus items especially if you repeatedly play through the levels of the game, just make sure to pick ones that are not you can't evolve (since you'll pretty much earn random items anyways). Try to take note that every time you decompose an item, a gauge called Lost Casket fills up gradually. When full, tap it to obtain bonus items -- one of which is the "Tarot Fortuneteller" set -- a rare outfit that can only be obtained through this process.